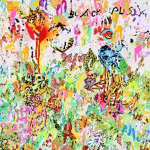 Black Pus is a one-man-project by Lightning Bolt drummer Brian Chippendale, who also uses various effects which makes him sound like a complete band (live also!). If you are familiar with the music of Lightning Bolt you know what you have to expect – brutal noise at the edges of free jazz/improvised music and alternative rock. Sometimes you should write a review while the impressions are still fresh and while you are still agitated and confused. The day before I saw Black Pus at one of my favorite spots, Weikersheim’s W71, and it really required everything from the deplorably small audience – physical and mental. Before the gig started Brian Chippendale was hanging around, chatting with the audience and his tour managers, obviously a polite and joyful guy. And then, almost casually, he puts on his mask, which includes his microphone, and he turns into a different persons – mad, threatening, schizo (he makes weird jokes), energetic, wild, hyperactive. He looked like a person from another planet. 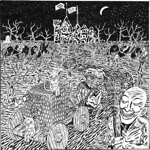 The two tracks on this split LP represent this impression – Chippendale attacks his drums like a lunatic, relentlessly, as if there was no tomorrow. The sounds behind the drums remind of Lasse Marhaug’s electronic debris, but then again he resolves the aggressive tension into wonderful humor when he includes a sample Bonnie Tyler’s “Total Eclipse of the Heart” (his song is also called “Total Eclipse”). Absolutely great! P.S. : Oozing Wound is a band which transfers Black Sabbath’s slow and gloomy metal approach to noise rock. Like a huge monolith, heavy, intimidating, bright and shining. The bands are a very nice match. An even better representation of Black Pus’s cosmos is Chippendale’s “All My Relations”, his first Thrill Jockey release from 2013. What makes this approach so outstanding is that he uses all the noises, sounds, even the lyrics as the background for his drumming – and not the other way round. As a result you feel as if you were thrown in a giant food processor, as well as Suicide electro riffs, Ministry noise, children’s lullabies, ghost train sounds, heavy metal guitars, distorted lyrics, monstrous reggae dubs, monotonous samples, amusement hall sounds - with the drums as a solo instrument dancing above it all. Loudness is an integral part of Chippendale’s musical concept, at concerts you can hardly make it without earplugs. The sound is perfect though, but the squealing and the frequencies cause physical pain. It is the soundtrack of a world gone mad. Key tracks are “Nowhere to run” and “A Better Man”, which sound like a huge wounded dragon in its cave, breathing heavily, his ears ringing from the blood that pulses through his veins, exhausted from a horrible fight. At the end of the concert (45 minutes, which was just perfect), Chippendales takes off his mask and metamorphoses to the friendly, funny and nice guy he was before. As if he was an actor in a role. On my drive home (almost two hours) I enjoyed the silence of a German highway at 1 p.m. I put off the music on my stereo. The sounds in my head were loud enough. Thanks for the review Martin, I'm a fan of Lightning Bolt and wasn't aware of the new Black Pus record. Btw, if you're into that sort of hyper-caffeinated drum workouts, I also recommend Hella with the incomparable Zach Hill on drums. I haven't been aware of Hella so far and I immediately watched "Biblical Violence" on youtube. Great stuff, thanks for the recommendation, Julian. After the Weikersheim concert I talked to Brian Chippendale and he told me that he was in the studio with Lightning Bolt and that there will be a new album and a European tour soon. Great news. Yeah, Biblical Violence is from their first and probably best album - great stuff indeed. That being said, I'd argue that some of Hill's musical activities outside of Hella are even more interesting: Check out Damsel (with Nels Cline on guitar) and Shred Earthship (duo recording with Mick Barr), too. New Lightning Bolt is always good news - somehow, their music never gets old, although they rely on a rather simple formula. Wow, that Lightning Bolt track you linked to was just what my brain needed. I'm looking through their catalogue. Any thoughts on the best Lightning Bolt album? If I may put my two cents in, I'd say start with Hypermagic Mountain. LB really are stubborn like a caveman, so the differences from album to album aren't that big, but this one marked a transition to longer songs and better production values that I found pretty exciting when it came out. "Ride The Skies" and "Wonderful Rainbow" are my favorites. You won't be disappointed, Richard. Thanks, guys. I'm on my way to the store!